UPDATE 18/01/19: Unfortunately due to health issues MeloDownz has had to postpone this summer's Melo & Blues tour and cancel his headline shows in January and February. Ascending local hip-hop star MELODOWNZ shares his intriguing double EP MELO & BLUES. MELODOWNZ is equally in demand as a recording artist and a live performer, with countless features under his belt in recent months, and support slots for some of the biggest international visitors - YG, Buddy, RL Grime and Desiigner, Slick Rick and Raekwon - and a recently wrapped up a tour with Oddisee. With MELO & BLUES, MELODOWNZ takes his highly anticipated new project on the road this summer. 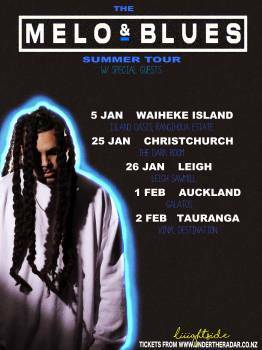 MELO & BLUES features Kiwi artists including Louis Baker, Troy Kingi, Israel Starr, Villette and UK rapper COOPS. Production credits include Baccyard, Dusty Melody, Haan 808 and Mikos Da Gawd (Who has produced for Anderson .Paak & SiR). Listen to the outstanding new release from one of New Zealand's most exciting music artists now on iTunes, Apple Music and Spotify.